Player are set in 3 lanes, each player with ball. First in line starts at same time, needs to go towards cone , perform a turn, come back to starting cone another turn, again towards center cone turn, back at start turn, first touc set his shot. First of the 3 player that scores a goal without ball to ouch ground gets a point. Start with player A passes to B, who comes up and ask for ball.. A makes a run by sideline, to receive from B, dribbles and makes a cross for a one touch finish from C. After passing the ball, B makes a turn and gets in position to finish. Allow 2 touch finish ( set the shot and take it after), if 1 touch not possible. A goes to B after cross and B goes to D after finishing. Attacking team ( 6 players) can score only after making 5 consecutive passes ( with max 2 touches). They will score at the goal from the otherhalf from where the fifth pass was received. 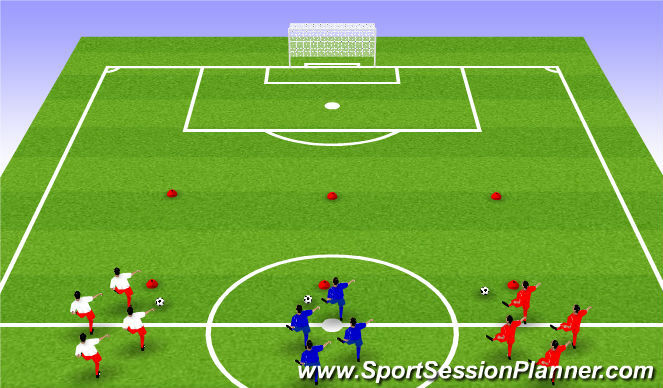 Defending team: try to win the ball and counterattack. Can score at any net, as fast as they can after winning the ball.